Over the weekend Tropical Cyclone Kelvin developed an impressive eye hours after moving inland near Anna Plains, Australia. Typically tropical cyclones weaken after landfall due to increasing friction and the loss of access to the energy provided by warm ocean waters. However, there are many records of tropical cyclones that maintain their strength or intensify after landfall. Northern Australia is one of the most favored regions of the world for this unique phenomenon known as the brown ocean effect. A brown ocean effect can occur in warm, wet, tropical or subtropical environments when there is sufficient heat and moisture in the ground to transfer energy to the atmosphere, similar to a body of warm water. The energy transfer helps maintain clouds and convection and can lead to the development or maintenance of deep core convection in a landfalling tropical cyclone. This activity sometimes leads to tropical cyclone intensification well after landfall. Northern Australia is a prime location for the brown ocean effect because of its monsoonal climate. 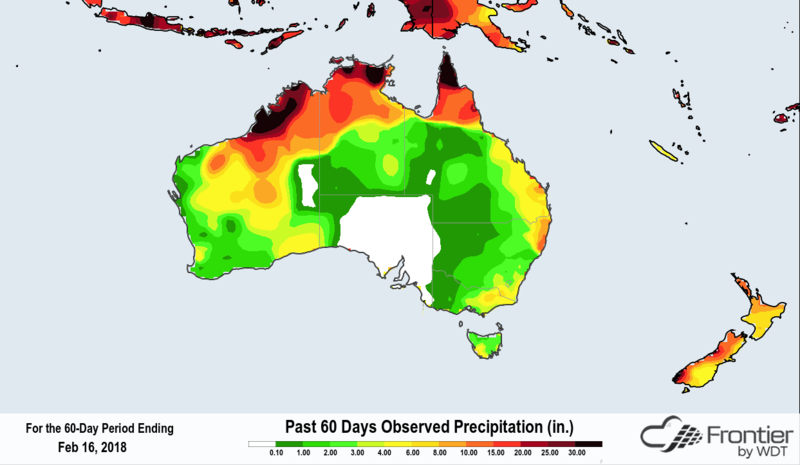 During the southern hemisphere summer, Australia heats up, and heavy rains develop over the northern portion of the continent as the monsoon trough moves over the area. The rainy season can also be enhanced by the wet phase of the eastward-moving Madden-Julian Oscillation (MJO). For example, over the past several months, portions of Pilbara, Kimberley, Top End, and the Cape York Peninsula have experienced above-average precipitation. This moisture helped to create the layer of warm, wet sandy soil needed for the brown ocean effect. In the case of Tropical Cyclone Kelvin, it appears that the above-average seasonal rainfall was sufficient to dampen the soil and allow for significant latent heat transfer to the atmosphere. Deep convection was noted directly over the center of the storm as it moved inland on February 18, 2018, but Kelvin lacked an eye and did not have the appearance of a particularly intense cyclone. However, over the next 6 to 10 hours an eye developed and became more defined even as Kelvin tracked further inland. During this intensification phase, rains of more than 1.5 inches per hour and frequent lightning occurred north of the cyclone’s center south of Broome. Kelvin’s peak intensity was estimated by the Joint Typhoon Warning Center (JTWC) to be 80 knots (92 mph) while the Australian Bureau of Meteorology (BOM) analyzed Kelvin’s winds to be 60 knots (69 mph). Part of this difference is due to JTWC using 1-minute average winds and BOM using 10-minute average winds. When you convert the BOM’s intensity to 1-minute winds, Kelvin would have been designated as a Category 3 tropical cyclone on the Australian intensity scale, or hurricane strength (75 mph) on the Saffir-Simpson scale. The satellite structure and “eye” did support hurricane strength even though there were no confirmed wind reports at ground level. In this case, high winds were confined to a minimal area, with the primary inland threats being heavy rainfall and flash flooding. 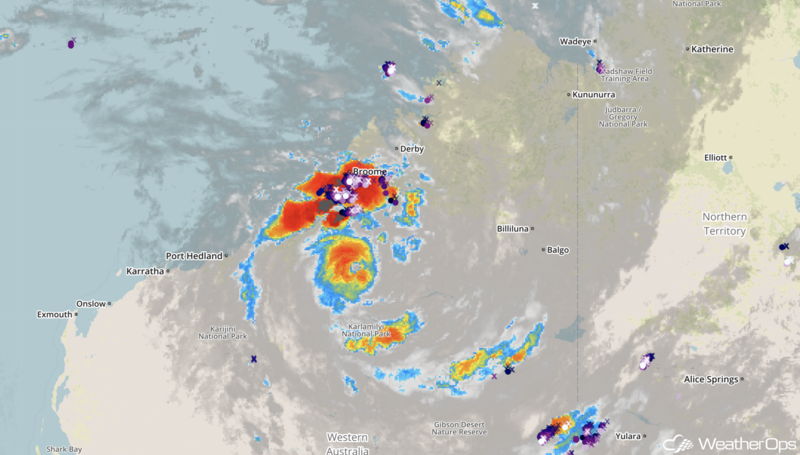 As Kelvin continued tracking even farther southward into drier portions of Western Australia, it became disconnected from the moist, tropical air mass and weakened rapidly. Kelvin is the sixth and strongest tropical cyclone to develop so far this Australian cyclone season. 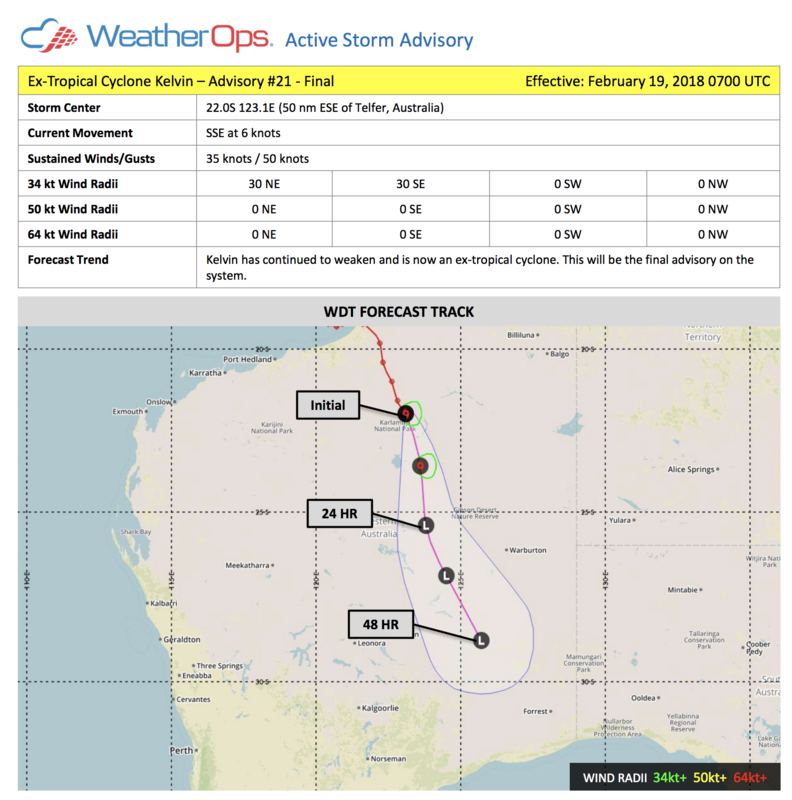 Our customers can stay up-to-date on the latest tropical weather conditions and tropical cyclone threats via our Australia Region Tropical Daily Planner and Active Storm Advisories.